Name: Named in antiquity (see Pliny the Elder, 79 CE) molochitus after the Greek μαλαχή, “mallows,” in allusion to the green color of the leaves. Known in the new spelling, malachites, at least by 1661. Locality: Nizhne-Taglisk, Ural Mountains, Russia. 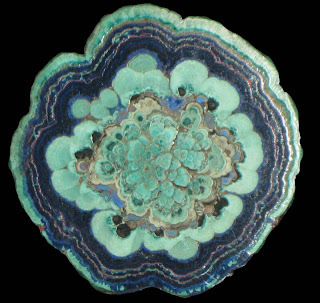 Malachite is a copper carbonate hydroxide mineral, with the formula Cu2CO3(OH)2. This opaque, green banded mineral crystallizes in the monoclinic crystal system, and most often forms botryoidal, fibrous, or stalagmitic masses, in fractures and spaces, deep underground, where the water table and hydrothermal fluids provide the means for chemical precipitation. Individual crystals are rare but do occur as slender to acicular prisms. Pseudomorphs after more tabular or blocky azurite crystals also occur.